Today I’ve got a very special post to share with y’all! It’s an interview with Bridget of Royal Bohemian Home - the beautiful handmade pillow shop that you may have seen pop on your Instagram feeds. She has lots to share with us today about her background in fashion, how she got started with RBH, and lessons learned along the way At the end, you’ll hear about her big dreams for RBH and what her favorite products are right now. A very warm welcome to the Mix & Match Design Company blog, Bridget! Tell me a little bit of your story. What’s your personal/professional background? And where are you based currently? I am originally from Ohio and moved to the city of Philadelphia after college. I wanted to start a new adventure in a new city, so I packed up a U-Haul and moved myself to Philly. I was working as a retail manager for Urban Outfitters, when a job opportunity at their corporate office was brought to my attention. I interviewed for the position and ended up getting the job, which was in the Design Department of Free People. My job was to communicate with vendors overseas, to ensure each style was completed from sketch to finished prototype, as the design team had intended. I managed multiple seasons at a time, with hundreds of styles per season. It was fast paced and exciting for a newbie in the industry and I learned so much about textile, manufacturing, design, and construction of clothing. It was really my first break into the industry. Years later I was offered a job as a Buyer, which catapulted me into a completely different direction in the fashion industry. As a Buyer, you are choosing the assortment of clothing that will be offered to the customer in your stores. Buying is a very analytical job - reviewing sales numbers and working with set budgets to create seasonal assortment, but it also has a creative side. Buyers work closely with Design to produce a collection that is both on trend and that your customer will ultimately want to buy. My husband and I moved to California, and I continued to work as a Buyer for several large retailers in Los Angeles. After having my son Liam, I found the job and hours were too demanding for me to be the kind of mother I wanted to be. It was at that point that I made the decision to take a break from the fashion industry and stay home with my son. This was definitely one of the hardest decisions of my life, but in hindsight, it was the right decision for me. We moved back to Philadelphia years later, and most recently we settled down in the darling city of Kennett Square, Pennsylvania. It's fun to chat with another creative entrepreneur who is based in Philadelphia! Tell me about Royal Bohemian Home - how did you get started and what made you want to launch a handmade pillow company? Where did the name come from? In 2015, my daughter Margot was born. As a stay-at-home mother of two children, I was very much consumed by the day-to-day duties of caring for my them. While I loved having these precious days with them, I felt a deep desire to find a creative outlet. My interests had naturally shifted from fashion to interiors. I was busy making my house a home - decorating and coming up with creative ways to show my personal style through decor. 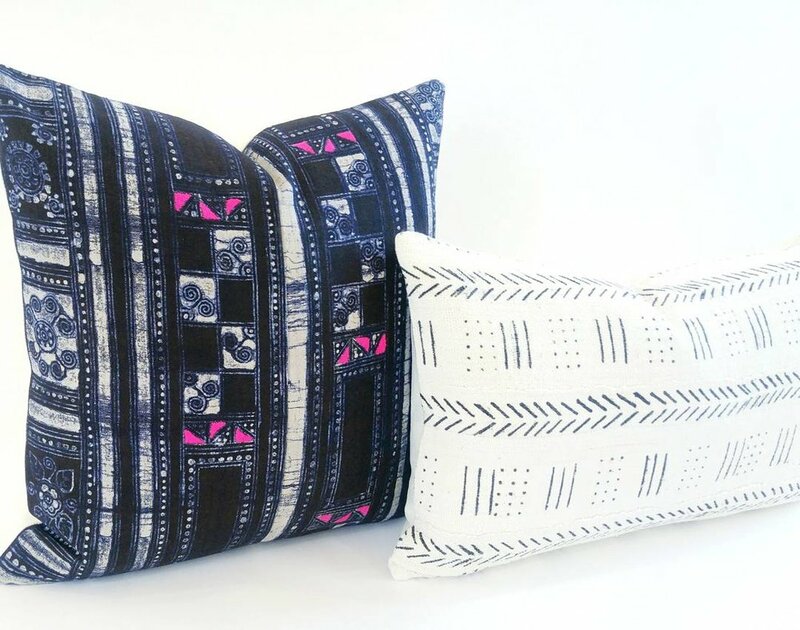 I was looking around for decor inspiration online one day, and I came across the most lovely textiles (African Indigo Mudcloth and Batik Hmong textiles from Thailand, specifically). I have always been a textile junkie and when I saw these gorgeous fabrics, I instantly wanted to know more. I began doing research and was blown away by the craftsmanship that went into these handmade textiles. For example, I learned how the indigo mudcloth textiles are handwoven and dyed by placing the textile into indigo pits (passed down in families from generation to generation) for weeks, soaking in the natural pigments of the indigo plant to achieve that beautiful blue hue we all love. The black and white mudcloth textiles (another one of my favorites) are hand painted using fermented leaves - each one telling a story through the symbols the artists draw on these unique pieces of cloth. I was excited about the opportunity to use these newfound treasures in my own home and thought, how great would it be to introduce others to these textiles? I instantly thought of decorative pillows, since they are a favorite of mine for bringing pattern and color into the home. It was at that moment that Royal Bohemian Home came to life. I knew the business end of retail, but I didn’t know how to sew, or how to go about starting a small business (very important pieces to the puzzle!). I am quite a perfectionist, so I knew if I was going to try my hand at this, the product had to be perfect in order to do these fabrics justice. I reached out to a local business owner who specializes in printing fabrics and manufacturing home décor items. After meeting and showing them my vision for Royal Bohemian Home, she agreed to collaborate with RBH and to “show me the ropes” of the pillow business, training me on cutting and sewing, and everything in between. I had no idea how much went into creating these incredibly beautiful textiles! Why did you choose to use vintage rather than new for your products? They’re so lovely, but I imagine they’re more challenging to find. How in the world (literally!) do you go about finding the perfect ones to use? Initially, I fell in love with the look of these fabrics and the story behind how they are made. The decision to use vintage textile over new textile is just a personal preference. I have always been a lover of vintage, be it clothing or furniture. I love the idea of upcycling and reusing things in a different way than they were originally intended. The Hmong Batik fabrics I use from Thailand are intended for tribal costumes (skirts and vests), and are also used to make traditional baby carriers. I love the natural wear and patina of these textiles that were created 50-100 years prior. When I choose fabrics for my collection, I am thinking about the person who hand-embroidered the fabrics and the person that designed the amazing shibori pattern on the piece of indigo before me. I am proud to be able to preserve these textiles in a way that makes them usable in modern, everyday life. Sourcing them is not always easy. With global textiles growing in popularity, it is harder to find good quality vintage pieces. I do love the hunt and searching for the perfect pieces of fabric. I will pretty much buy my fabrics wherever I can, but I mainly source them from a few vendors I have befriended, flea markets, and I plan to start attending textile trade shows this year. In the future, I would love the opportunity to travel to the countries where these textiles originate and make direct relationships with local artists and families who have been making these textiles for generations. I feel like your gorgeous pillows have been blowing up my Instagram lately (in the best way possible!) and showing up on a lot of my favorite feeds - what do you think has attributed to the excitement around your products, and how have you gotten your name out there? Thank you so much! We are a small company, so we don’t have a huge marketing budget. I use social media (specifically Instagram) to showcase our pillows and to share a little history of the textiles themselves. I love that Instagram is such a visual app. It allows our followers to get an up-close look at our products and to follow along as RBH evolves as a company. I really enjoy engaging with our followers and customers, and Instagram has provided an amazing platform to do so. Their comments, product feedback, and words of encouragement motivate me and make we want to make RBH the very best I can. I have found a huge community of artists/craftsman, shop owners, interior designers, and bloggers on Instagram that are so supportive of one another. It is refreshing to see people encouraging and inspiring one another, rather than bringing them down. I am inspired daily by the people I follow on Instagram, and I hope Royal Bohemian Home does the same for our followers. As far as the excitement over our products, global textiles are definitely having their moment in interior design. Even the big retailers such as Pottery Barn and Target are creating home décor collections from fabrics inspired by African Indigo and Mudcloth. With so much mass production out there in the retail space, I think more now than ever, people are appreciative of the handcrafted goods Royal Bohemian Home has to offer. People want quality over quantity. We source the best vintage fabrics we can find, and include a plush down feather insert with every pillow. Our high standards have not gone unnoticed, and I cannot tell you how many customers write me raving about the quality of our pillows. RBH customers want something for their homes that is one-of-a-kind and that tells a story - something that has a little history and meaning. In the interiors world, we often talk about fashion trends influencing home decor trends and vice versa. As someone who has been involved in both of those fields, how do you see them interacting with one another? Also, would you say your own personal style (fashion or interiors) aligns with RBH’s style? There is an undeniable connection between fashion and interiors. Both are fields where personal expression and creativity are the drivers. They follow similar trends in color, textiles, and design principles, making the correlation even stronger. I think a person’s home almost always resembles their fashion sense. It wasn’t always this way, but more and more I see people expressing their personal style through their home decor choices. It seems natural for someone who loves colorful clothing to have a colorful home. I would say that Royal Bohemian Home’s aesthetic is a reflection of my personal fashion sense and decor style, although both are ever-changing, so it will be interesting to see how RBH evolves through the years. Royal Bohemian Home is about natural earthy textiles, bright cheerful color, and streamlined design; all the same words I would use to describe my fashion sense. I created Royal Bohemian Home from the heart. It is all the things I love and put in my own home. I love that! Your passion for this business is so inspiring. When you imagined your career path, did you ever think it would involve becoming a small business owner and creative entrepreneur? What are your favorite parts about being a small business owner and what’s most challenging? When I stepped back from my career to stay home with my children, I never thought that was the end. I am a “reach for the stars” type of person. As long as I can remember, I have always had a dream of having my own business doing something creative - one that is fulfilling and makes me happy. I think a lot of people have this dream, but most are scared and don’t act on them. It is not easy to take that leap into a new venture with so many unknowns ahead of you. I can recall many moments during the initial month of RBH, when I would start to have cold feet and let self-doubt creep in. It is natural to have a little bit of an emotional rollercoaster when starting your own business. I am so grateful for the support and encouragement from my husband, George, during moments like these. He is the owner of a software startup, so he is familiar with the ups and downs of starting a business from the ground up. He would offer me words of wisdom, but mainly he would remind me of why I wanted to start this business in the first place and reignite that fire in me. Having the support of family and friends is super important to a small business owner. My favorite part of owning my own business is that it is just that, it’s mine! 😊 I can call the shots and make decisions for my business, on my terms. Royal Bohemian Home is my creative outlet. I want the processes of my business to be enjoyable and something that I am excited to do. This is my playground to experiment with different fabrics, products, and design. I like being in control of the pace of how my business grows. The hardest part of being a small business owner (especially in the beginning) is that you wear many hats. I am basically a one woman show, so I do it all; fabric sourcing, pillow-making, photographer, shop owner, marketing, and accounting. It can be a challenge to do it all, and to do it as well as you would like, especially when you are a self-proclaimed perfectionist. As a small business owner myself, I can identify with so much of what you’ve said. Running it certainly can be a challenge, but it’s the best kind of challenge in my book. 😊 You mentioned that you left your high-stress job in the fashion industry to stay home with your kids. How do you manage running RBH, maintaining family time, and keeping up with other parts of life? Are there any strategies or methods that have worked well for you? Two small strategies that I have found help me with balancing family and work are to stay super organized and to allow myself plenty of time for project deadlines. I like to be proactive and work on projects little by little, so if there is a day when I can’t do much work for my business, I won’t fall behind on deadlines. I am also very fortunate to have a supportive husband who pitches in around the house and with the children whenever he can. What’s coming down the pipe for RBH? Any insider knowledge you’d be willing to share? The beauty of Royal Bohemian Home pillows is that we use one-of-a-kind fabrics, so our inventory is always changing and looking fresh. I am constantly on the hunt for new fabrics, so you will definitely be seeing new global textiles coming into the mix. I also plan on introducing some new products for the home in addition to our signature pillows. Our Indigo throws (which are mended by hand and finished with a clean edge) are currently made to order, but we plan to start carrying them regularly in our shop, as well as some other fun accessories for the home. RBH is always partnering with local shops, interior designers, and bloggers on fun projects, so make sure to follow us on Instagram to be the first to hear about our new arrivals, sales, and giveaways! If you were to dream big, where do you see your company in five years? That is a great question - big is the only way I know how to dream. In five years, I would love to see Royal Bohemian Home become a recognizable brand in the home decor arena. It would be fabulous to partner with one of my favorite retailers for a collection or two. I would also love to see RBH start to design our own fabrics, inspired by the global textiles we love so much, and create exciting collections for the retail market. Do you have a personal favorite product right now? African indigo and white mudcloth will continually be favorites in my shop. They always look fresh and brighten a room. 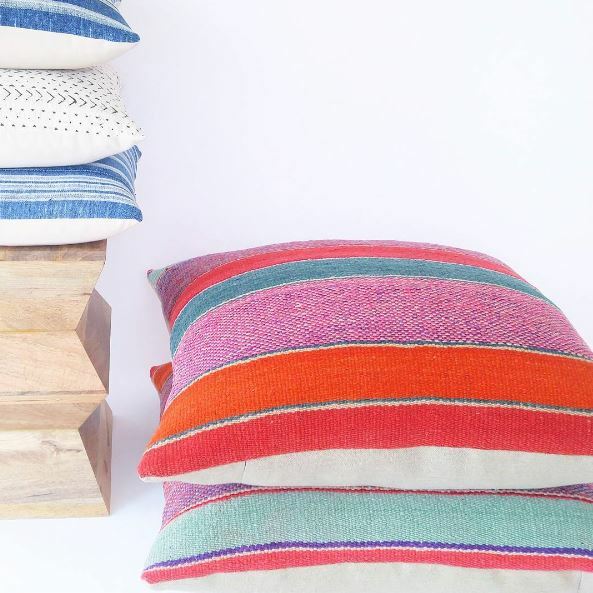 We also have a new textile in our shop, Peruvian Frazada, that is insanely gorgeous. Made from handwoven and naturally dyed wool, each textile takes a month to create. We offer a variety of pillow sizes in this textile, but my absolute favorite is the 30x30 floor pillow. Perfect for lounging and ready a book, extra seating for hanging with friends, or take them outside for a picnic or to stare at the stars at night. Best of all, they look amazing stacked in a corner of a room, even when not in use. They are a must for summer! I love that the shop is ever-evolving, and that you’re developing and bringing in new products all the time. Where can everybody find your products and follow along with you? You can find Royal Bohemian Home products on Etsy at www.royalbohemianhome.etsy.com/ and follow us on Instagram @RoyalBohemianHome. Thanks so much for sharing your story, and for telling us more about RBH, Bridget! I love reading about small business owners’ backstories, dreams, and everything in-between - it’s so inspiring and lets us in on the human side of the biz. Mix & Match readers, let's show RBH some love today! Make sure you visit the Etsy shop and Instagram account, and let her know that I sent you when you say hello! *This post contains affiliate links. That means when you buy through my links, I'll earn a small commission from your purchase at no cost to you. Thanks for supporting Mix & Match in this way!